With President Obama consistently holding a lead in polls of Ohio, Mitt Romney may need to devise a strategy to win the Electoral College without it. Mr. Obama has received a number of favorable polls in Ohio lately, and the most recent ones suggest that his advantage may be continuing to expand there. On Tuesday, The Washington Post published a poll showing Mr. Obama with an eight-point lead in Ohio. Then on Wednesday morning, a poll published by Quinnipiac University, The New York Times and CBS News put Mr. Obama 10 points ahead there. 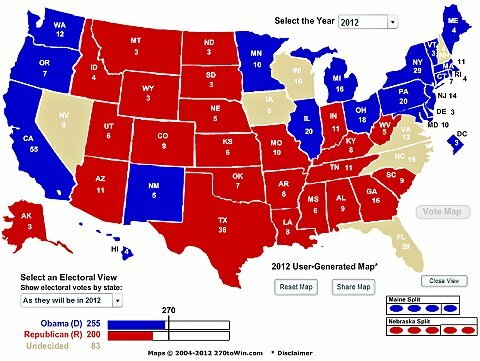 Mr. Obama is unlikely to win Ohio by an eight- or 10-point margin unless Mr. Romney’s electoral map has completely fallen apart. But the consensus of the data has nevertheless been quite favorable for Mr. Obama in Ohio. In three other polls since the Democratic convention that used industry-standard methodologies and called cellphones, Mr. Obama’s lead in Ohio was between five and seven percentage points. Mr. Obama’s lead in Ohio has been smaller in polls that used different methodologies. However, there can be little doubt that he is ahead there now. When we ran the FiveThirtyEight model on Tuesday night — after the Washington Post poll was published but before the Quinnipiac/New York Times numbers — its “now-cast” estimated that Mr. Obama would have a 96 percent chance of winning Ohio in an election held today. Mr. Romney has a larger chance of winning Ohio, about 20 percent, according to the model’s Nov. 6 forecast, which accounts for the additional uncertainty between now and the election. The FiveThirtyEight forecast has been reluctant to accept the idea that Mr. Obama could overperform his national numbers in Ohio, in part because it evaluates past voting trends in a state in addition to the current polls. On Tuesday, however, the forecast shifted to project a 3.7 percentage point win for Mr. Obama in Ohio, incrementally better than his projected margin of victory nationally, 3.5 percentage points. And that was before the Quinnipiac/New York Times poll was published, which is likely to expand the gap. So can Mr. Romney win the election without the Buckeye State? The FiveThirtyEight forecast currently has Mr. Obama as at least a 90 percent favorite to win in states totaling 237 electoral votes. (This list includes Pennsylvania and Michigan, where Mr. Obama’s lead in the high single digits.) If you add Ohio to his column, Mr. Obama is up to 255 electoral votes. 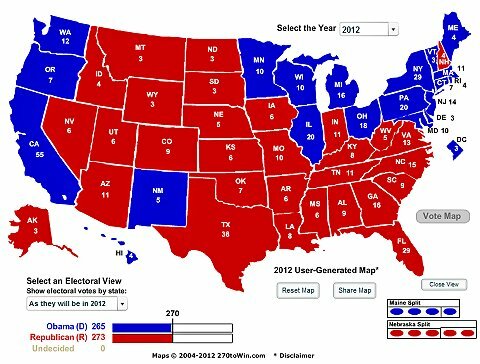 But 255 electoral votes would not be enough for Mr. Obama to clinch the Electoral College; that would require 270 votes. Thus, it would not quite be appropriate to call Ohio a “must-win” for Mr. Romney. In fact, he could lose it and still have 14 electoral votes to spare. Mr. Romney would burn through that slack immediately if he lost either Florida (which has 29 electoral votes) or North Carolina (which has 15). Of these, Florida is the bigger concern for Mr. Romney. Both states have featured somewhat inconsistent polling, but Mr. Obama’s highs have been higher in the Florida polls, some of which have given him a lead in the mid-to-high single digits. Losing both Florida and Ohio would almost assuredly be impossible for Mr. Romney to overcome. Out of the 25,001 simulations that we ran on Tuesday, there were literally zero cases in which Mr. Romney won the Electoral College despite losing both states. A more favorable piece of news for Mr. Romney is that he could lose both Ohio and Virginia and still win the election, as they would only suffice to give Mr. Obama 268 electoral votes, although Mr. Romney would need to sweep all the other competitive states. The combination that should perhaps most worry Mr. Romney, however, is the following: Mr. Obama wins Wisconsin and Iowa in addition to Ohio. Usually, Wisconsin and Iowa are the alter egos of Ohio: highly competitive states that are just a bit blue-leaning, as compared to Ohio’s slightly red-tinged history. 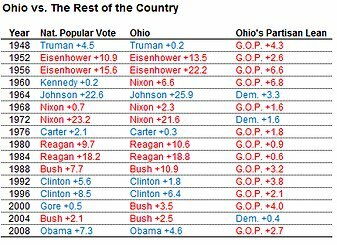 The last time that the Democrat performed more strongly in Ohio than he did in Iowa was in 1980, when Jimmy Carter lost both states, but Ohio by a slightly narrower margin. The last Democrat to perform better in Ohio than he did in Wisconsin was Hubert H. Humphrey in 1968, who lost Ohio by two points, but Wisconsin by four. In other words, it seems unlikely that Mr. Romney can salvage either Iowa or Wisconsin if he’s already lost Ohio – in which case he will lose the election. But since Mr. Romney is intrinsically drawing to an inside straight if he loses Ohio, the path through Iowa looks at least a little bit more favorable to him. Iowa was polled sparsely until recently, and although the recent polls there have not been great for Mr. Romney, they are better for him than in Wisconsin, where the bounce that Mr. Romney got following his selection of Representative Paul D. Ryan as his running mate seems to have evaporated. The map below, in which Mr. Romney wins Iowa despite losing both Ohio and Wisconsin, would suffice to give him 273 electoral votes. In the simulations where Mr. Romney won the election despite losing Ohio, this was the case that came up most frequently. Mr. Romney would also need to win Nevada in this eventuality — a state where he has never held the lead in a public poll. It isn’t a great plan. But when you’re the Republican candidate and are down outside the margin of error in Ohio with six weeks to go, you don’t have any great plans. Mr. Obama’s probability of winning the Electoral College rose to 79.7 percent on Tuesday in the FiveThirtyEight forecast, up from 77.7 percent on Monday.